**Perfect for fans of Joanne Fluke and Leslie Meier, national bestseller Lucy Burdette's eighth Key West Food Critic mystery sees the return of fan-favorite food critic Hayley Snow, who must once again get to the bottom of a bitter murder. In this 8th book in the series food critic Haley Snow is helping her mom with a catering gig at an important event. The event is to bring together Key West and Cuba. But when an important artifact goes missing and there is a murder on the first night of the event, the catering gig may be a bust. Of course Nathan Haley’s hunky detective boyfriend warns her to stay away from the investigation. But when the family of the deceased ask for help, Haley can’t resist. This is the first book in this series I have read. I think as a reader I should have read the books before it. I felt like it would have helped me with getting to know the characters better, gave them more depth. I especially would have loved to know the whole story behind how Haley came to be in Key West. I enjoyed reading this cozy mystery. It had a little bit of everything in it. It had danger, mystery, love, friendship and family. This book had tons of interesting and highly entertaining characters. It was a steady paced read that will keep you guessing till the end. The only thing I really did not like was the political aspect of the story. I find that story line a tad boring and overkill. But the book did have a lot of interesting history behind it to make up for it. The ending was wonderful and I even cried a bit. Yes I cried! I am such a baby. Overall this book was a great cozy read. It includes some really good recipes in the back of the book, that I must try. Yummy!!! I would love to read more of these books and get to know Haley and the gang a bit more. So if you like Jimmy Buffet and a good dose of who done it, then this book is for you. Pick it up today. 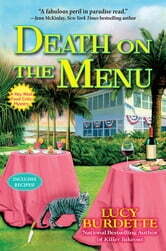 DEATH ON THE MENU by Lucy Burdette is the 8th book in the Key West Food Critic Mystery series. It’s the story of Hayley Snow who works as a food critic for KEY WEST magazine. Her Mom, Janet, has landed the prestigious catering job for the big Havana/Key West conference which is hoped to begin to bridge the gap between the two countries. Although she has many stories to get turned in, Hayley and Miss Gloria, Hayley’s octogenarian roommate who she adores, are up to their elbows assisting in all aspects of the catering job. On the first day of the 3 day event at the Truman Little White House, one of Hemingway’s prized possession, the Nobel gold medal for “The Old Man and the Sea”, comes up missing. That evening there’s a vast array of entertainment both on stage and off from Jimmy Buffett, Barack Obama and Diana Nyad on stage and off stage the discovery of the missing employee whose been murdered with none other than one of Janet’s knives. Hayley is enlisted by Gabriel’s family to please help them find out who murdered their loved one so that he’s not just another “brown skin” to be swept under the rug and forgotten. Hayley not only wants to help find the murderer but she wants to keep them safe when the victim’s sister goes missing as well. At the same time, the police are desperate to solve the case and to find the missing medal before the conference is over. Maybe they can work together be it all not planned? I loved the way the author wrote such a masterful mystery and was still able to weave true facts and history into the story. You can tell she did vast research into everything from the local and celebration foods to the little details of the Truman Little White House. She was able to bring in facts about Hemmingway, Barack Obama and even fun knowledge e of the Jimmy Buffett Parrothead. Lucy kept us entertained and turning pages. She made us hungry with delicious food details and then gave us the recipes to satisfy our hunger. This book can be read as a standalone even though it’s in a series. It’s very easy to figure out who is who and keep up with the wonderful story. I for one, can’t wait for the next installment in this wonderful series and will be checking out other books as well. Recommend this to anyone that loves a GREAT cozy mystery that will have you guessing and second guessing along the way! A deliciously entertaining read, DEATH ON THE MENU is filled with memorable characters, scrumptious food references, and interesting details about Key West. I especially enjoyed how Burdette weaves in tidbits about Cuban-American history and touches upon the relationships between the two countries. The mystery seemed to be overshadowed somewhat by the other events, but I found this to be an enjoyable book nonetheless. Disclosure: I received a free copy of this book. Death on the Menu by Lucy Burdette is A Key West Food Critic Mystery. Hayley Snow is helping her mother cater a three-day event at the Harry Truman Little White House in Key West, Florida. Catering the Cuban/American conference is a coup for her fledgling business. Nathan Bransford, Hayley’s boyfriend, would prefer if Hayley bowed out since it is a controversial event and protestors will be present. On the first day of the event, Hemingway’s Nobel prize gold medal for Old Man and the Sea on loan from Cuba disappears. It is the first time the medal has ever left Cuba and the Cuban delegates are outraged. Despite searches of the house and staff, they are unable to locate it. That night as the flan is being served, Gabriel is found stabbed to death in the kitchen closet. Gabriel’s family asks Hayley to investigate his death and get justice for the family by finding his killer. Despite Nathan’s objections, Hayley plunges into the case. Miss Gloria and Hayley are worried about the houseboat for sale next to them. The last tenants were party hearty types that continually disturbed the residents of Houseboat Row. Plus, Hayley has articles to write for Key Zest magazine and little time to sample the local Cuban cuisine for her critique. Hayley is in for a busy weekend in Death on the Menu. Death on the Menu contains good writing and engaging characters. Lucy Burdette does a wonderful job at world building. She includes various shops and sites in Key West. Her descriptions bring the area alive. I do not recommend reading Death on the Menu without having read An Appetite for Murder which will give you an introduction to Hayley, her friends, her job, and the area. I liked the inclusion of Key West history and information about Ernest Hemingway (adds to the world building). There are some lovely cozy moments in the story along with tasty food descriptions. I am a fan of Miss Gloria and I envy the pair living on a houseboat (except when a hurricane is approaching). I like Miss Gloria’s love of sequins (it is cute) and Hayley’s love of high top tennis shoes (I adore my Converse and have them in different colors/prints). While I am not a fan of Nathan, he does do something at the end that puts him a better light. I did feel that Death on the Menu is a slow starter and the pace throughout the book was slow. The mystery was interesting, but I wish it had been more of a challenge to identify the guilty party. I felt that some details were missing from the story (what is the mother’s name and the name of her catering business for example). There are recipes included at the end. They include Cuban roast pork, black bean soup, mojito cake and flan. I thought the ending was sweet, romantic and upbeat. Join Hayley Snow on her latest sleuthing adventure in Death on the Menu.